The dominate language is English - anything which claims to have international relevance is written in or translated into English. Therefore any researcher or ophthalmologist is supposed to be able to speak English as well as his native language and no matter what the native language is - English sets the standard. Despite that, international communication is far away from being standarized. In English or any other language no standards for terminology and a nearly uncountable number of expressions, synonyms and abbreviations exist plus a large number of competing classifications and grading schemes for diseases This confusion is multiplied by multilingual communication. Therefore there is a clear demand for a monolingual dictionary with synonyms and abbreviations as well as a multilingual dictionary with corresponding translations. 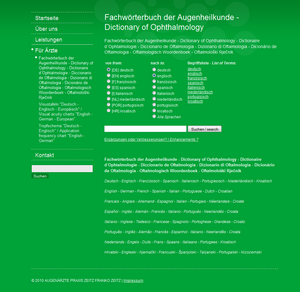 There are dictionaries of this kind for general medicine but they hardly exist for specialized fields such as ophthalmology, even though digital media offer excellent conditions for them as a digital dictionary does not necessarily need a primary structure. 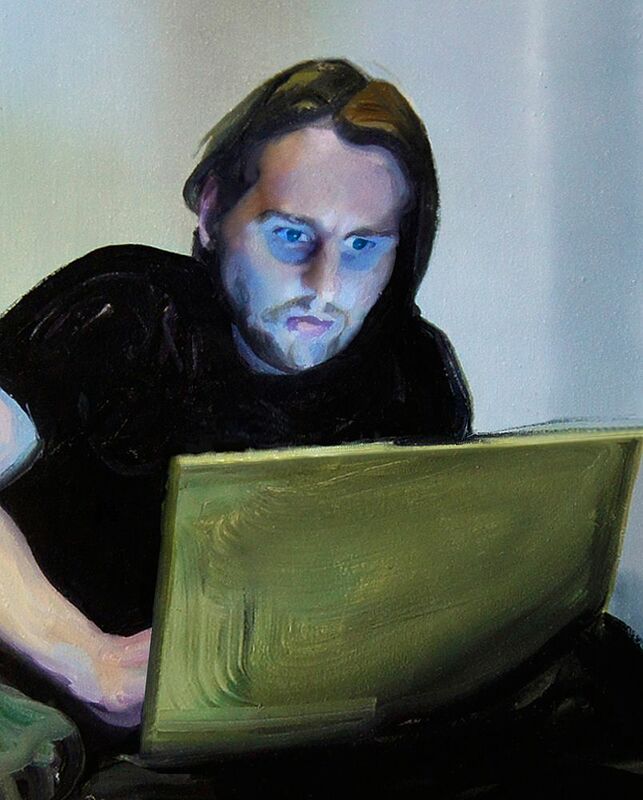 Instead of the usual hierarchic organization known from textbooks or the alphabetical order of conventional dictionaries, a digital approach enables a so called "rhizomatic organization", referring to the poststructuralistic concept of the "Rihzome" as developed by Deleuze and Guattari. A rhizomatic organization permits information to be dynamically structured, i.e. alphabetically and/or in related clusters and/or anatomically and/or pathophysiologically - all independent from each other. Also searching terms is more versatile in digital media - it is possible to search for all terms containing "retin", irrespective of where it appears in the word, e.g. "chorioretinopathy". 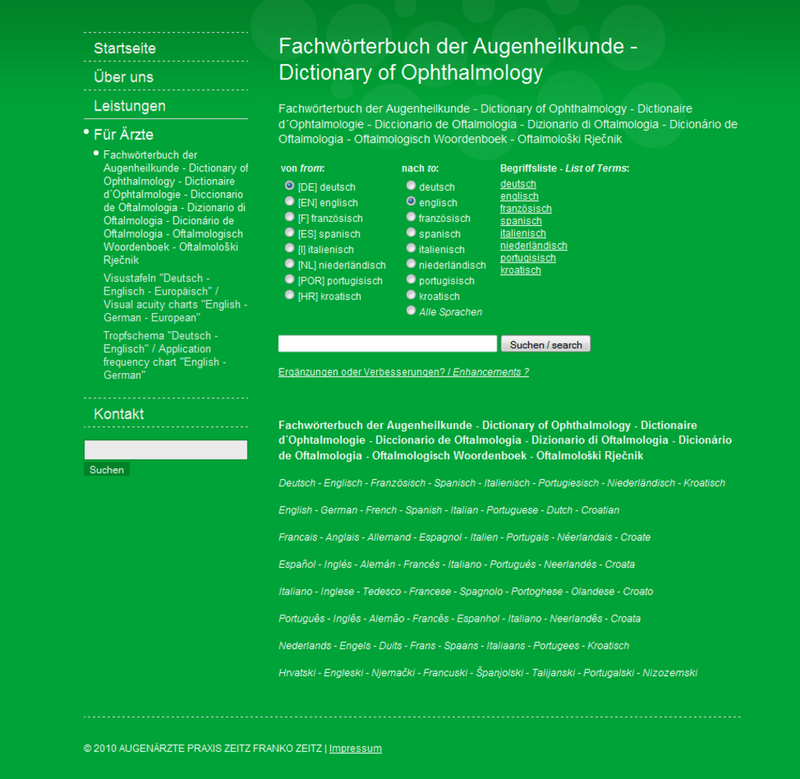 Therefore Philipp Franko Zeitz Dictionary of Ophthlmologystarted with the development of a multilingual “Dictionary of Ophthalmology” which is available to anybody at free access through their homepage. Recently, they expanded the formerly bilingual dictionary (English-German, 5000 entries) by 2300 entries into 6 more languages (Spanish, French, Italian, Portuguese, Dutch and Croatian) and are permanently working on enhancements. Anybody who is missing a term or wants to send a correction of course is welcome to submit it as they rely on the effect of collective intelligence for improvements. For a scientific analysis of the topic Philipp Franko Zeitz joined forces with Jun.-Prof. Dr. Wiebke Petersen from the Institute for Computational Linguistics at the University of Düsseldorf. As part of this collaboration a publication is planned for the near future. Studied Medicine, English, Biochemistry and Communication in Essen, München, Los Angeles and Durban.